Q is an exploration of urban isolation. It captures a random moment in dance. It is nite. In the streets. At this moment one man struggles to take another step forward. Two strangers try to pass by each other, and a trio is locked in anonymous antagonism. These six men pass closely, maybe even repeatedly, and yet never have a chance to find friendship with each other. The movement was developed though experimentation with internalizing the fear of strangers passing on the street. In the rehearsal process we imagined someone unknown to us passing by, in the nite, in an unfamiliar part of the city. What does he want? How can I protect myself from him? These unfounded fears spur small tension in our bodies. We tracked the tension and developed choreography out of both the subtlety of these tensions and the expansions of it to grotesque forms. In the shooting of the work we continued the experimentation with scores developed in rehearsal. These explorations are colored by dancers grounded in disparate dance disciplines. I am very interested in playing with the line between what looks like very pedestrian movement and yet is actually highly choreographed. Even though my interest is in going beyond traditional forms, each dancer has dedicated himself to a primary training: Post-Modern Dance, Tango, Butoh, or Contact Improvisation. In the project footage on the DVD you may recognize some elements of these forms. IÃ­m trying to bring a typical choreographic process to the art of making cinema. The movement is based on an idea. The structure of the piece will be based on the movement that was generated out of the idea. The choreography will be structured largely in the process of editing the films. I like to let the work take shape organically without presupposing too much from the outset. 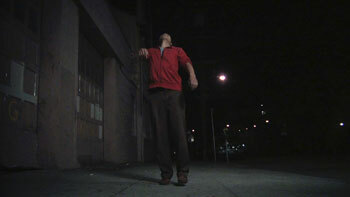 Q is the third film of a series of dance film portraits. IÃ­m trying to find an exquisite little conjunction of choreographic, cinematic and poetic practice that illuminates something unique in this hybrid medium. This idea of a moving portrait allows me to go beyond the usual narrative conventions of cinema and the usual abstract conventions of post-modern dance. IÃ­m trying to get at an essential expression, something unmediated by spoken or written language. GoodGuy/BadGuy is the hero of a small flat planet. While on tour in a dusty western settlement he commandeers an abandoned space rocket, and blasts off on his own personal space odyssey. Awakened by the sound of the rocket, the townspeople try to stop their hero from leaving. In a panic the entire town runs to the launch pad. Slim Virginia, the only criminal in town, is left alone in jail. She breaks out and flees to the uncharted territory of Dung Valley. The story follows the simple people of this decrepit town as they try to track down their criminal without the guidance of GoodGuy/BadGuy. On the televisions of his rocket GoodGuy/BadGuy watches the townspeople struggle with the questions of what is good and what is bad as he travels to find the ultimate truth about where they all come from. Through GoodGuy/BadGuy’s journey and the townspeople’s folly we are confronted the mysteries of this flat planet. The Sheriff discovers if Slim Virginia really is bad. Slim Virginia finds the truth about Dung Valley. The Mayor learns the difference between good and bad from Television. And, GoodGuy/BadGuy finds out why they live on a flat planet. Black and white notions of Good and Bad degenerate into philosophical crises, unleashing a series of absurdly ominous events climaxing in the destruction of the town by an army of mutant cows. When GoodGuy/BadGuy finally walks off into the sunset only one question remains: Why does GoodGuy/BadGuy wear no pants? 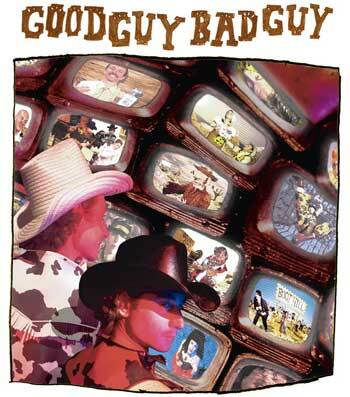 GoodGuy/BadGuy is a feature length animated Space Western. This film is told in a highly stylized form of animated still photographs using real people and constructed sets, absurdly characterized dialog, original music and song. GoodGuy/BadGuy was developed through a process of live performances that began with a residency at The LAB in San Francisco during 2000/2001, and continued with performances at Highways Performance Space in Los Angeles and Sushi Performance & Visual Art in San Diego. I was marveling about the miraculous consistency of baloney. It’s a perfect circle, It’s got a perfectly even color and texture. Ue called it robot food. It’s too perfect for human consumption. I would prefer less perfect food.